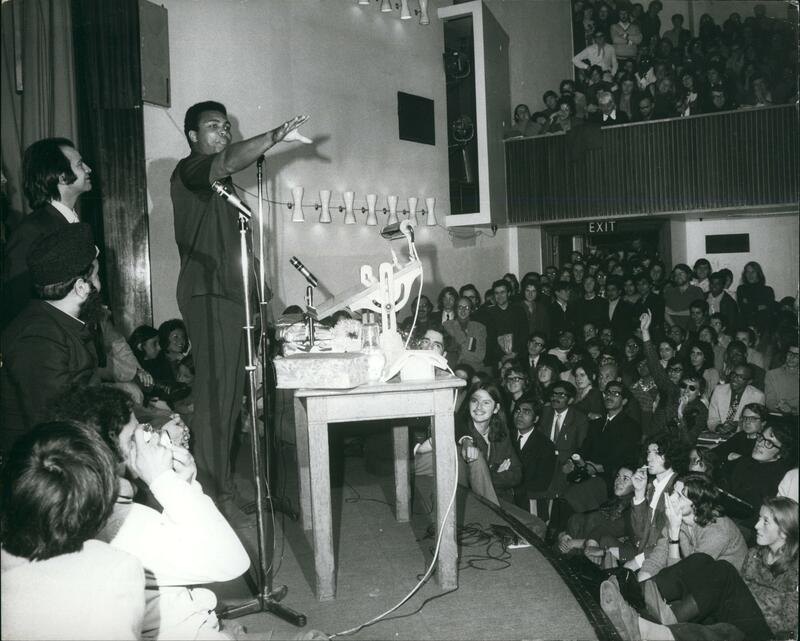 On 10 October 1971, Muhammad Ali took to the stage in front of a full house at LSE’s Old Theatre. LSE’s Hayley Reed finds out more. 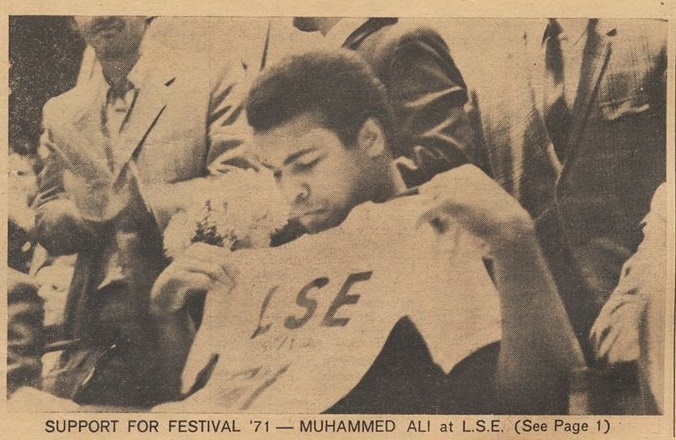 His trip to London was part of a European and the Middle Eastern boxing tour, but he spoke to the audience at LSE about boxing, Black Power and politics. This issue of the Beaver, the LSE Students’ Union newspaper, is dated 28 October 1971 and features a review of the talk on the front and back pages. Back copies of the Beaver are available in LSE’s Digital Library. Were you in the audience at the Old Theatre for Muhammad Ali’s visit? Did you produce this report for the Beaver? Or were you involved in LSE Festival ’71? We’d love to hear from you in the comments box below. I was in the audience, I remember his massive presence filling the stage.. Some of his views were very unpalatable, but he was my boxing hero and I was star struck. I was also in the audience. He was a remarkable speaker. Never used notes, just spoke from the heart. As he left coming out of the main doors of the old theatre I was surprised at just how enormous he was. I thrust a hand out and he grasped it shaking my hand. Great moment. I still remember that day when on my invitation he came to LSE ( I brought him from the hotel) to make the speech. I went to the hotel to get him with my younger brother Ijaz Hashmi. I remember him telling me – you have to drag me to the stag and if i am lost in the crowd I will not be able to reach. I can be seen in the first picture standing besides Muhammad Ali in black suit. I still remember every word he stated in the speech. He was a remarkable person. Such a remarkable legend. I was in the audience that day. His visit was eagerly anticipated by everyone – not least me – and from memory not only was the Old Theatre full, but there was a relay to the New Theatre, and I think there were some additional relays such was the popularity of the visit. It was not long after he had changed his name as part of adopting some pretty radical views. He came on stage and advocated what was effectively apartheid – a completely separate area within the USA for black people to live. Not surprisingly this went down like a lead balloon with the audience, nearly 100% of whom were anti-apartheid, and many of whom had been protesters against the 1970 Springbok tour only the year before. Apparently this reaction also occurred in several other universities across Europe at which he spoke. Ali was a very likeable and intelligent man, and it is extremely interesting and comforting that he went back to the USA, reflected on his reception in Europe and came round to a very different mindset – a story that should be made known to every advocate of “no-platforming”.